Tall quail flower shaped garden container made of terra cotta. In Arizona, we have many quails running the area and we really enjoy them. There is nothing sweeter than seeing a momma and daddy being trailed by 7 little ones. 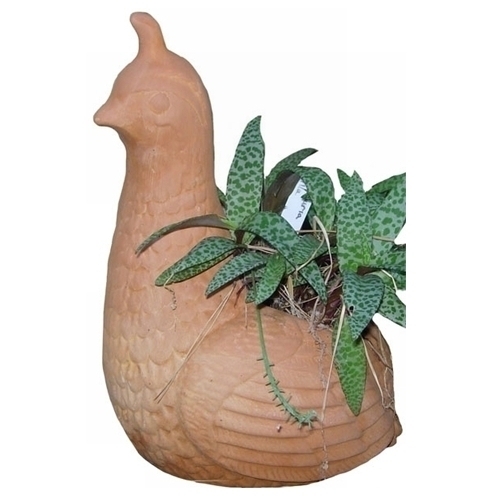 Our terracotta quail garden planter is made of real clay with lots of fun details. From the feathers on the chest to the top hat these flowerpots are playful and functional. Fill the opening of each animal planter with colorful flowers, succulents or green houseplants. Be sure and pick up a few of the babies to match. Place these animal pots around your patio or garden area or give them as gifts for holiday and birthdays. For years these clay animal planters have been best sellers! Everyone loves their uniqueness.